who lived a life that itself is worthy of a fine movie. 1. To what extent do the chapters concerning the elderly HJ Whitley enhance the chapters recounting the young H J early tragedies? In what ways do the chapters about the young H J contribute to a deeper understanding of the elderly H J’s life? 2. What are the roles and importance of faithfulness and loyalty in The Father of Hollywood? In what ways does Keith contrast the difficulties and tragedies of his personal life with the equally impressive loyalties and instances of caring about his businesses? 3. How did you react when you learned how Hollywood was named? Have you every experienced an epiphany in your life? 4. Discuss the importance of the suffragettes in The Father of Hollywood. How did it effect the founding of Hollywood? 5. Does Gigi have free will? If so, how and when does she use it? If not, what aspects of society constrain her from doing so? 6. 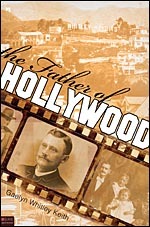 Discuss the role of love and family in The Father of Hollywood. What special quality does H J and Gigi’s love have? 7. Discuss the stylistic, thematic, and cultural role of Hollywood in the book. Did H J have a specific agenda in making Hollywood the center of action as well as a symbol of prosperity? 8. What is the lesson of the story? 9. What inspired the title? 10. Would you say this is an optimistic or pessimistic book? 11. How did the generations influence each other? 12. Discuss the different kind of relationships the Whitley siblings have with their parents. Is Ross Gigi’s favorite ? 13. What type of marriage do you think H J and Gigi have? How do you feel about H J as a father and a husband? How do Gigi’s children feel about her? 14. Which are the most sympathetic voices in the book? Discuss which characters you most and least identify with. 15. What does the memoir reveal about the ways in which human beings deal with death, grieving, and letting go of loved ones? 16. Why do you think Grace’s chapter is placed where it is? How does her chapter change your earlier perceptions of the Whitley family? 17. Gigi meditates on the distance between words and actions. Is Keith saying that words—her own chosen medium—are inadequate? 18. The Whitleys must endure a number of obstacles on their journey through life. To what extent are the elements against them, and to what extent do they sabotage themselves? 19. What compels loyalty in this family? What are the ways in which that loyalty is betrayed? Who do you feel makes the ultimate sacrifice for the family? 20. How are H J and Gigi Whitley described? What sort of life do they lead? What does the story warn against?